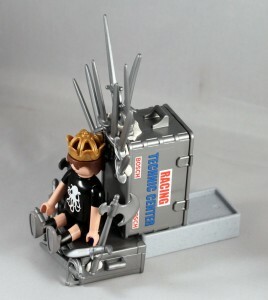 These are so cool – I love Lego! So do we! 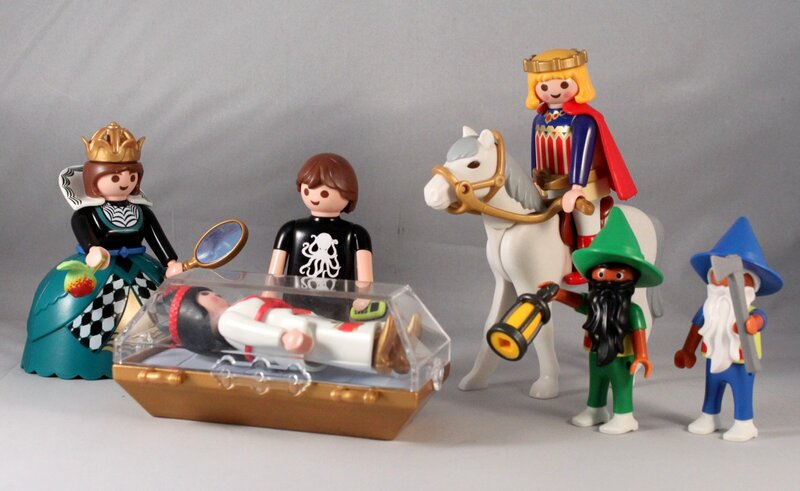 Lego is indeed cool - but we use Playmobil figures (known as “klickies”) for our re-creations. That doesn’t look like Mark’s signature hair! We know, we wish it did! Unfortunately Mark’s hair hasn’t been replicated in plastic yet, so we went with what we had. 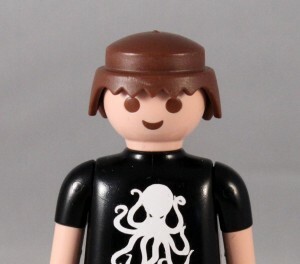 Whenever Mark wears a hat, he’s also wearing different hair. Mark plays bass! Why is he holding a guitar?! Playmobil only makes a guitar, no bass. In 2013 they introduced a “Rock Star” theme, including a great stage, microphones, guitar stands and amps. They missed the boat by not taking that opportunity to introduce a bass into the lineup. Why is Tom dressed in brown? With emo hair? We needed to pick a Tom look that could represent him at any stage in his career. His brief all-brown-all-the-time look amused us, so we went with that. Travis’s hair isn’t like that anymore! True, but it did look like that at one point, and as we like the spikey look, we choose that. Also, the hair is bright orange, but we took a Sharpie to it and coloured it. 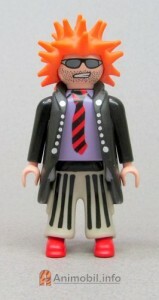 Orange hair as seen on its original figure. Why did you just spell “colour” with a “u”? Yes, and as they would be very hard to replicate on such a small toy, we choose some arms that came with small tattoos on them already to infer the rest of his ink. What celebrities have made appearances? Pete Wentz has made several appearances. Patrick Stump, Hank Williams Jr, Jeffree Star, Destiny’s Child, Eminem, Katy Perry, Lady Gaga, Gallagher, Jack from All Time Low, Prince, Prince William and Princess Kate, and Sylvester Stallone have all also appeared. We’ve had those too! Belle, Downton Abbey. Breaking Bad, Game of Thrones, Gandalf, Harry Potter, Katniss, Prim & Peeta, Gilligan, Lost, Obi Wan Kenobi. The 10th & 11th Doctors, and Link from Legend of Zelda have all shown up. Do you fix Mark’s typos? This is a tough one. Not the ones he makes on purpose! There was one that he left a word out and we put it back in. Why does he always carry a phone? There are a lot of scenes with Mark in a coffin. What kind of kids’ toys come with coffins?! That particular piece is from a Snow White and the Seven Dwarves set. We didn’t have that set, and it has been discontinued for years, but we waited patiently until one came up on Craigslist. You changed Mark’s shirt! He used to have a white button up with a grey sweater! That was what we chose when we first started, but once we made the octopus sticker for the black t-shirt we’ve stuck with that. How often do you make scenes? Why are there none on Saturdays? We did put an extra one up one day when Mark had made several Game of Thrones tweets in one morning. We quickly threw together our version of the Iron Throne, with Mark as the King, and made our contribution to the Game of Thrones discussion. Why did you start doing this?! 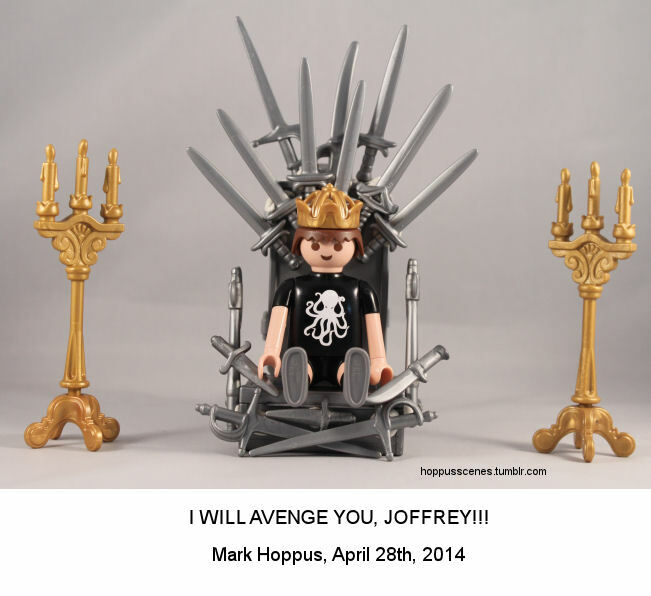 In early 2013 the teenaged co-creator of Hoppus Scenes (we’ll call her Josie) was very sick. She missed five months of school, and spent a huge amount of this time with her Mom (we’ll call her Wendy). Josie and Wendy filled the days with board games, card games and listening to music. There was a lot of Blink-182, Green Day, Panic at the Disco, FOB and many others playing all day. At this time, Josie also got more into Twitter and Tumblr, and she started reading out loud to Wendy the hilarious tweets by Mark Hoppus. Wendy later discovered that Josie had been omitting the more adult ones, and leaving out the swearing. Wendy thought it might be fun (and help pass the time!) to re-create Mark’s tweets together using the Playmobil toys that were in the attic from where they’d been stored since the family had moved four years earlier. The boxes of toys were retrieved, dusted off, and a passion for Playmobil was reignited. The first few scenes were done just on the floor in the living room, but when this didn’t produce quite the look we wanted, a small photo cube was purchased and the rest is history! After several weeks we started adding the Throwback Thursday pictures in as a regular feature. As they sometimes need photoshopping (backgrounds, shirt logos etc), this endeavour now became a complete family affair, with Wendy’s husband and son (we’ll call them Sally and Holly) helping out with that aspect. Josie (mostly) recovered from her illness, headed back to school in the fall of 2013, and Wendy kept going creating scenes with input and support from Josie. Mark follows you on Twitter?! He does! We were extremely excited when Mark became one of our first followers, and thrilled that he has continued to support us by favouriting and retweeting occasional scenes. Just how many of these toys do you have?! Quite a lot! We recently sorted the entire collection into themed containers to make it easier. And then wondered why we hadn’t done that sooner. 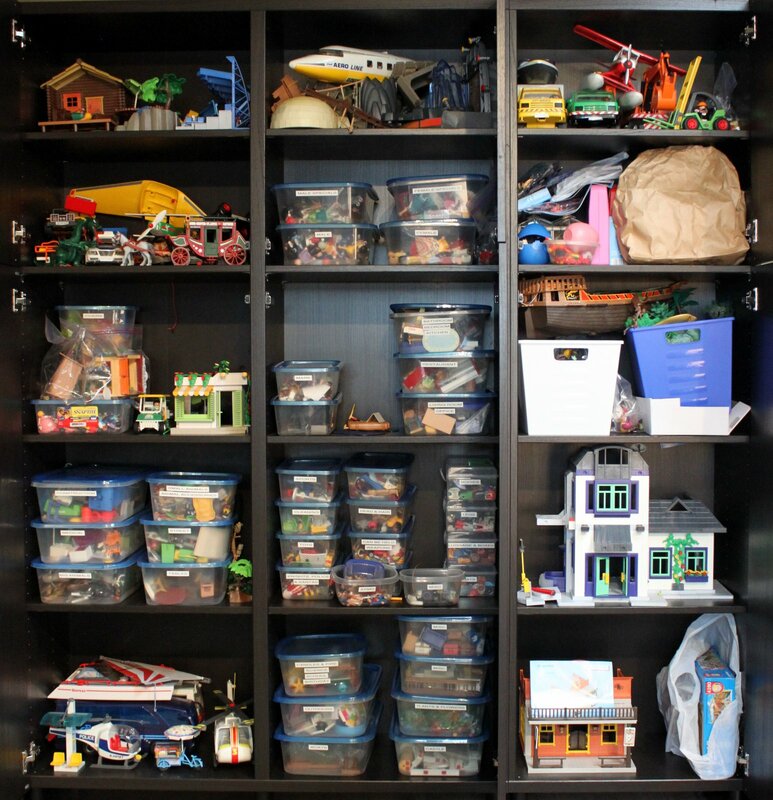 Storage units full of Playmobil.